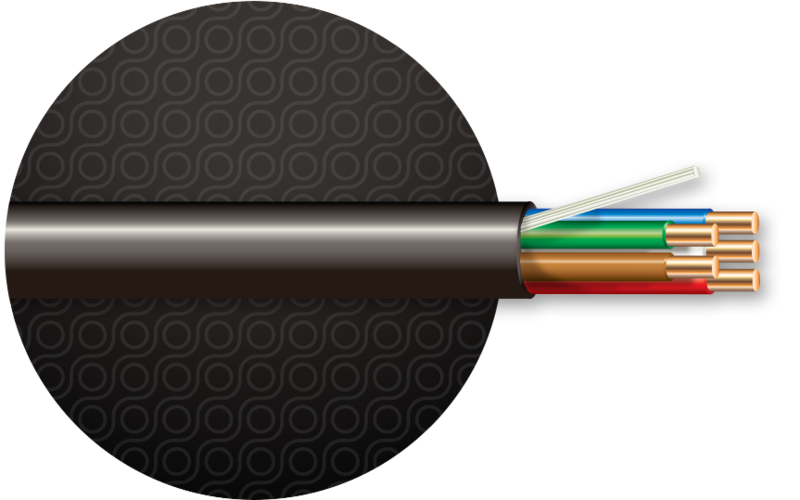 Cerrowire® Sprinkler System Wire is 18 AWG made to customer specifications with 4, 5, 7, or 10 conductors, suitable for direct burial on applications up to 30 volts, including field and central controls for underground sprinkler systems. 50’, 100’ and 500’ lengths. Insulation is 0.016″ nominal-wall SR-PVC, and jacket is 0.025″ nominal-wall black polyethylene with a parallel ripcord. 6 to 10 soft bare copper conductors (to order) are twisted without fillers to a LHL. 4- and 5-conductor constructions are parallel.